Oh, HP. How you try. The company just pulled the sheet back on its first Chromebook, the Pavilion 14 Chromebook. But in traditional HP fashion, the notebook is bulky and expensive. 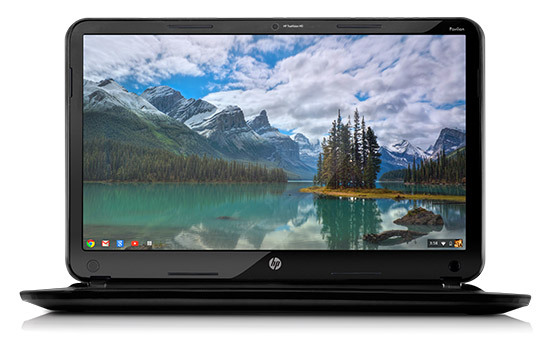 At $329, the most expensive new Chromebook on the market. It’s a cool $80 more than the much-sleeker Samsung Chromebook and a $130 more than the Acer C7. The extra cash nets buyers a 14-inch screen and a Intel x86 chipset rather than an ARM chip inside the Samsung. All three models have 2GB of RAM. The Intel 1.1GHz Intel Celeron 847 CPU chipset inside the HP likely runs slightly better than the ARM chip. But this is a Chromebook. You run Chrome on a Chromebook. Not Photoshop. The Samsung Chromebook correctly mashes a sleek casing with a computing platform in an affordable package. The HP does not. Not only is the HP more expensive, it’s significantly bulkier at 4 lbs rather than 2.5 lbs in the Samsung. Plus, strangely, the battery in this larger notebook is rated for 2 hours less use time than Samsung’s (4.25 hours vs 6.5 hours).